An ensemble of totally random trees. 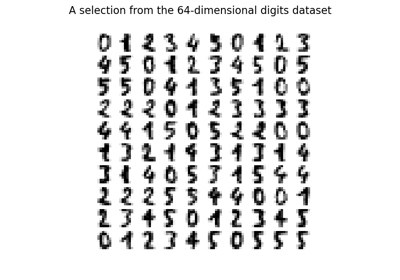 An unsupervised transformation of a dataset to a high-dimensional sparse representation. A datapoint is coded according to which leaf of each tree it is sorted into. Using a one-hot encoding of the leaves, this leads to a binary coding with as many ones as there are trees in the forest. 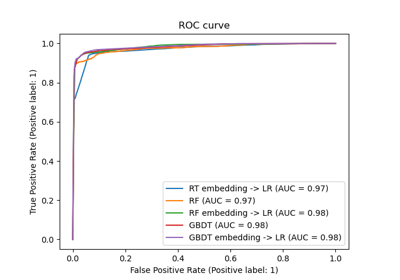 The dimensionality of the resulting representation is n_out <= n_estimators * max_leaf_nodes. If max_leaf_nodes == None, the number of leaf nodes is at most n_estimators * 2 ** max_depth. Changed in version 0.20: The default value of n_estimators will change from 10 in version 0.20 to 100 in version 0.22. The maximum depth of each tree. If None, then nodes are expanded until all leaves are pure or until all leaves contain less than min_samples_split samples. If float, then min_samples_split is a fraction and ceil(min_samples_split * n_samples) is the minimum number of samples for each split. If float, then min_samples_leaf is a fraction and ceil(min_samples_leaf * n_samples) is the minimum number of samples for each node. Whether or not to return a sparse CSR matrix, as default behavior, or to return a dense array compatible with dense pipeline operators. The number of jobs to run in parallel for both fit and predict. None means 1 unless in a joblib.parallel_backend context. -1 means using all processors. See Glossary for more details. Controls the verbosity when fitting and predicting. When set to True, reuse the solution of the previous call to fit and add more estimators to the ensemble, otherwise, just fit a whole new forest. See the Glossary. The collection of fitted sub-estimators. P. Geurts, D. Ernst., and L. Wehenkel, “Extremely randomized trees”, Machine Learning, 63(1), 3-42, 2006.
apply(X) Apply trees in the forest to X, return leaf indices. fit(X[, y, sample_weight]) Fit estimator. 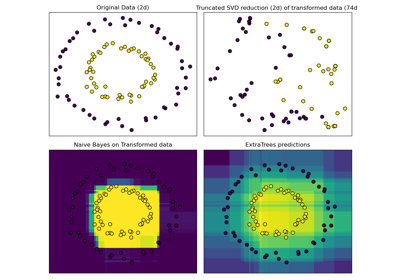 fit_transform(X[, y, sample_weight]) Fit estimator and transform dataset. Apply trees in the forest to X, return leaf indices. The input samples. Internally, its dtype will be converted to dtype=np.float32. If a sparse matrix is provided, it will be converted into a sparse csr_matrix. For each datapoint x in X and for each tree in the forest, return the index of the leaf x ends up in. The columns from indicator[n_nodes_ptr[i]:n_nodes_ptr[i+1]] gives the indicator value for the i-th estimator. The input samples. Use dtype=np.float32 for maximum efficiency. Sparse matrices are also supported, use sparse csc_matrix for maximum efficiency. Fit estimator and transform dataset. Input data used to build forests. Use dtype=np.float32 for maximum efficiency. Input data to be transformed. Use dtype=np.float32 for maximum efficiency. Sparse matrices are also supported, use sparse csr_matrix for maximum efficiency.